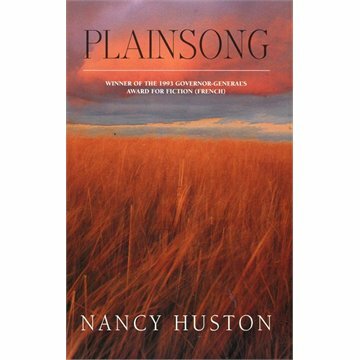 Canadian-born writer Nancy Huston has long been one of my favourite writers, and while reading Plainsong (published in 1993) I was kicking myself for not reading it sooner. The novel is filled with compelling characters and history, and written with Huston’s characteristic poetic, intimate style. Yet my main purpose in writing this post is not to cover Plainsong as a traditional book review. Instead, I’m more interested in the lines of thought this four-generation story provoked, the way it revealed my unconscious absorption of Canadian identity and history. Make no mistake; Plainsong is a damn good story. Though it contains a cast of many characters, its protagonist is Paddon Sterling, born in 1900. This multi-generational story, though centred upon Paddon, is narrated by his granddaughter Paula. It’s an unflinching telling of the deprivation, hardship, abuse, and lost dreams that characterized the lives of many who lived in the late 1800s or through the years of the two World Wars and the Depression. Plainsong grabbed me and kept me reading when I should have been working during the day, and sleeping at night. I read about Paddon’s father suffering through the punishing cold and poverty of the Gold Rush, and then how Paddon, trapped unwillingly into the life of a small-town Prairie schoolteacher, struggled to provide food for his family during the Depression. It made me reflect that we modern people don’t know what work and suffering are compared to what these people went through. Now, we think about “achieving our potential” and “finding fulfilling work”, but people of Paddon’s generation grimly did whatever they could to survive. Most of their work was backbreaking, soul-destroying and boring. They were forced to give up their dreams at a very young age (at university, Paddon thinks he’ll become a great philosopher). Plainsong depicts (realistically, I think), the way even passionate love and lust could be destroyed by privation and suffering. Some people turned to alcohol as their only comfort, and this often led to the abuse of women and children, victims of previously decent men’s frustration and despair. But some couples’ commitment and loyalty to each other were unshakeable. Today, it’s hard to imagine having the stoicism and sheer capacity for hard work—manual, repetitive work—that my grandparents’ generation had to endure. Men worked like horses and women gave up everything for their children. Much of the reason I liked Plainsong was because I felt connected to its events. On the surface, this seems absurd—I’m a modern, urban person—how could I possibly relate to the historical events of the settling of the Prairies, the Gold Rush, the World Wars, and the Depression? Well, my own grandparents lived through most of these events. As a child, I knew three of my grandparents well. One of my grandfathers grew up on a farm; my mother spent her childhood summers at the family farm when it still lacked electricity and running water. I visited the modernized farm and met my second cousins when I was a teenager. Another way I started learning about “the pioneers” at a very young age was by visiting Toronto’s Black Creek Pioneer Village with my family and on school field trips. (This “living museum” town opened to the public in 1960 and is still thriving now.) The “village” includes many original/restored buildings dating from 1816 to the 1860s. They are filled with furniture and artifacts from the 1800s, and costumed guides explain what daily life and work were like in a small Ontario village in the 1800s. I remember being amazed at how much the pioneers did “from scratch”—for example, not only sewing clothes, but shearing their own sheep for wool, carding the wool, spinning it, weaving it to make cloth, then dyeing it using juices from local berries. People were similarly self-sufficient with respect to food. They grew everything, using their scarce cash for only a few precious staples. Food was simple—and in the winter, when almost everything was pickled or heavily salted, not very plentiful or appetizing. Through the shared experience of my parents and grandparents, my personal “family memory” goes back over a hundred years now. Yet I think I’ve absorbed Canadian history and a sense of the roots of Canadian identity more from literature than from personal knowledge. As I got older, I read other Canadian and American classics that taught me more about harsh times in those young nations’ histories: Steinbeck’s The Grapes of Wrath, W.O. Mitchell’s Who Has Seen the Wind, Margaret Laurence’s A Bird in the House, and short stories (whose names I don’t remember) set on the bleak and empty prairies. What must it have been like for people to see no one other than their own family members for months at a time? To be completely self-reliant even in times of drought, childbirth, and medical emergencies? I don’t think we, now, can even imagine the loneliness and brutal conditions faced by the early prairie settlers. Plainsong shares, with the classics I’ve mentioned above, the emotional appeal of complicated characters who are trapped by their historical and geographical settings. The reminded me how much reading has shaped my knowledge of my world, and more specifically, how it contributed to my understanding of what a “Canadian identity” is. More than that, Plainsong reminded me of the pure pleasure of reading, of being drawn into a world of fictional characters that seems real. Isn’t this the easiest way to learn? I wonder how many young people still read books that take them into the lives of previous generations. And even though I love all the possibilities that the online world has opened up for communication, entertainment, and learning, I feel some regret that my time spent online has caused me to almost abandon my long hours of reading. This entry was posted in Books and tagged "Little House Books", A Bird in the House, Black Creek Pioneer Village, Canadian identity, Canadian literature, John Steinbeck, Laura Ingalls Wilder, Margaret Laurence, Nancy Huston, Plainsong, The Grapes of Wrath, W.O. Mitchell, Who Has Seen the Wind by nancytinarirunswrites. Bookmark the permalink.